LoRaWAN LMIC 1.6 for Raspberry Pi with Dragino LoRA/GPS HAT or standalone RFM95W LoRa Module. This project extends the base LMIC 1.6 implementation with 915 subband selection and demonstrates how to use the LMIC 1.6 LoRaWAN stack on a Raspberry Pi targeting the Dragino LoRa/GPS HAT and a Raspberry Pi Zero with a standalone Hope RFM95W LoRa module. Hardware Abstraction Layer (HAL) for IBM's LMIC 1.6 communication stack targeted to Raspberry Pi and Dragino LoRA/GPS HAT hardware version 1.4. This code was forked from wklenk/lmic-rpi-lora-gps-hat and 915 subbase selection functionality added to allow for subbase 2 selection for Australia. There is now an additional preprocessor definition named "CFG_au915". Adding -DCFG_au915 along with the -DCFG_us915 on the LMICCFG line in the examples/projects.gmk file will enable Australian frequency selection along with 915 support. The lorabase.h 915 Frequency code was modified to add support for Australian LoraWan Frequencies. The code base has been tested with the HopeRF RFM95W transceiver and a Raspberry Pi Zero. You can pick up a RFM95W from Alixpress for US$5, they are cheap but fiddly to solder as pins do not match standard breadboard spacings. Note, the W at the end of RFM95W denotes Worldwide and is the module version that should be used outside of China. SX1272, SX1276 tranceivers and compatible modules (such as some HopeRF RFM9x modules) should work. See the bme280_periodic sample in the examples directory. This sample sensors the environment with a Bosch BME280 (Temperature, Pressure and Humidity) Sensor. I wired up a standalone HopeFRM RFM95 using an Adafruit Perma Proto Bonnet Mini Kit. I used different pinouts from the Dragino HAT to suit the physical layout of Proto Bonnet. You'll need to modify the default WiringPi and BCM pin definition in the hal.c file you'll find in the lora_gps_hat directory. The Dragino HAT Schematic is a useful reference. Wired as per this schematic. See The Things Network Azure IoT Hub Gateway project. 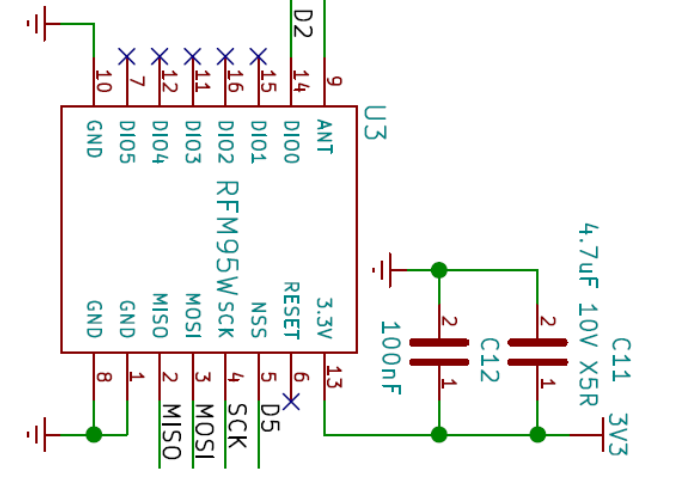 If you are using the BME280 Sensor then you also need to enable the I2C interface. IBM "LoRa WAN in C" is the LoRa WAN implementation of choice, and a perfect match to the IBM LRSC on the end device. It is provided as open source under the BSD License. This example does not use radio, it just periodically logs a counter value. Can be used to checked if the timer implementation on RPi works as expected and if SPI communication with the radio board is possible. 000000003 HAL: Detected SX1276 radio module. Adapt "application router ID (LSBF)" according for your network infrastructure. In case of The Things Network, this is the "Application EUI" of the application created in the TTN console. Double check that you use the LSB (least significant byte first) notation of the Application EUI. Adapt "unique device ID (LSBF)" according for your network infrastructure. In case of The Things Network, you need to register a new device using TTN console. Copy this "Device EUI" from the console and make sure you use the LSB notation. The LMIC 1.6 stack randomly chooses one of six frequencies to send the "join" message to the network. Tesing with a Kerlink IoT Station, only the following frequencies worked: 868.1 868.3 868.5 MHz The following default frequency did not work: 864.1 864.3 864.5 For this reason, I modified the code to only randomly choose between the three working join frequencies. This example verifies that the radio is working and that the node settings are correct and match your network infrastructure. It uses OTAA (Over the Air Activiation) to register the node. Note that this example won't work with a Single Channel Gateway. 000000000 HAL: Detected SX1276 radio module. What can be seen is that after sending the "join" message, the LMIC stack waits 5 seconds for the receive window and receives the acknowledgement from the LoRa gateway. Adapt "application router ID (LSBF)" like already described under examples/join. Adapt "unique device ID (LSBF)" like already described under examples/join. Adapt "device-specific AES key " like already described under examples/join. Added code that reads the CPU temperature of the RPi and returns it as a 2 byte integer value. This examples does a "joins" the network and then sends a sensor value (the CPU temperature) every 60 seconds as an unconfirmed message with a payload of 2 bytes. 000000004 HAL: Detected SX1276 radio module.